Low levels or lack of Vitamin A in a human body causes Vitamin A deficiency and it is the number one cause of what is known as preventable blindness in children and severe visual impairment. Vitamin A deficiency also increases the risk of death in infants. It is known to cause night blindness in pregnant women and escalates the chances of maternal mortality. It is usually the third trimester when the nutritional demands of both the mother and the unborn child become the highest. During this time if the body is suffering from Vitamin A deficiency then the mother can be at severe risk of night blindness.Vitamin A, therefore, is necessary for the body mainly to maintain normal visual function. However it has become evident that Vitamin A deficiency can also lead to the body’s growing inability to fight against infections. That will eventually result in many other illnesses and diseases. Children who suffer from it can even die from measles, extreme diarrhea or respiratory infection. Even a slight deficiency can affect them in the development of bones and their overall growth. Vitamin A deficiency is mostly registered in the developing countries and is rare in most of the developed ones. As it is, vitamin A deficiency has been diagnosed in almost half of all countries on the earth with most of them located in South Asia, South-East Asia and Africa. For some reason Vitamin A deficiency mainly affects children of small ages and pregnant women. It is obvious, that Vitamin A deficiency has dire implications, therefore a study has very recently been carried out by the World Health Organization to calculate the approximate number of children in these regions who suffer from it. The survey shows that around 250 million preschool kids already suffer from this health problem and it leads to a rising concern that places from where these numbers have been taken, might be inhabited by a large number of vitamin A deficient pregnant women. The survey also shows that every year a drastic number of 250,000 – 500,000 children become victims of vitamin A deficiency. Half of these kids then die within a year of losing their sight. The number of children who suffer from it every year and are under the age of five is 670,000. In order to understand the implications, causes and treatment of Vitamin A deficiency completely, let’s go through them step by step in this article. Reduced vision in the night or dim light; which means that they will not be able to distinguish outlines of images in reduced illumination. They might however still go on to see normally during day light hours until the night blindness turns into some other severe form. Dry eyes which could also lead to xeropthalmia; this is a severe form of night blindness in which the outer membrane of the eye, known as conjunctiva loses its goblet cells. These cells perform to release mucus in the eye, to keep it lubricated. 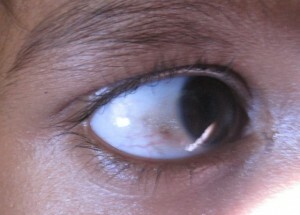 The loss of goblet cells results in this condition – xeropthalmia in which the eye can no longer produce tears. These dead or lost cells can even accumulate on the outer layer of the eye resembling a form of debris. This debris can easily lead to blindness or any other infection. Eye inflammation can also result from Vitamin A deficiency. Because of the inflammation, the eyelids and surrounding tissues along with eyes can get affected. This may include corneal inflammation as well. The child or adult may experience susceptibility towards respiratory infection and urinary infections. Growth can be halted in children due to vitamin A deficiency. Skin might also show signs of Vitamin A deficiency. For example it may get rough and/or dry. The best way to eradicate a problem is to discover what is causing it. Vitamin A deficiency, as is apparent from above-state information can lead to some serious health issues. It is important that everyone and especially pregnant mothers know about this as their vitamin A deficiency affects two people. Following is a list of some direct and indirect causes of Vitamin A deficiency. Of course the biggest reason behind Vitamin A deficiency is malnutrition. People who have a low intake of animal foods usually are at a risk of this deficiency. Animal food products and some vegetables are a rich source of Vitamin A. Breast milk contains good amount of Vitamin A for newborns. The mothers who don’t breast feed their children put them at a risk of developing Vitamin A deficiency. If a pregnant or lactating mother is Vitamin A deficient then the newborn baby is very likely going to be vitamin A deficient as well. Mal-absorption of vitamin A by the body can also lead to its deficiency. It can be due to sprue, celiac disease, obstructive jaundice, cirrhosis, giardiasis, cystic fibrosis or an over use of mineral oil as laxative. Over excretion of urine is also known to cause Vitamin A deficiency. Massive excretion can be caused by tuberculosis, UTI, cancer, pneumonia and nephritis. Lack of storage ability of Vitamin A by the body resulting from hepatic disease also causes vitamin A deficiency. Vitamin A deficiency can be treated if the state has not worsened for which early diagnosis matters a lot. A diet which is rich in Vitamin A is usually the treatment and the best prevention method of vitamin A deficiency. Liver, kidney, milk, cheese, cream and butter are rich sources of Vitamin A. Vitamin A can also be absorbed in the body through Carotene which is found in vegetables which have dark green vegetables. Vitamin A is also said to be present in fruits and vegetables that are yellow and orange in color. Food fortification also helps improve food quality. A lot of food stuff is fortified with Vitamin A to counteract the vitamin A deficiency. Both dry and oily forms of retinol acetates, retinylpalmitate and retinal esters can be added to fortify the product with Vitamin A. They are usually added to cooking oil and margarine. Other than the oil and margarine, Vitamin A is also added to sugar, cereals and milk/milk powder. If vitamin A deficiency is detected then it is imperative that one should start taking food products that are naturally rich in Vitamin A and those that have been fortified with it. Vitamin A can also be taken through medication in oral and injectable forms. Orally they can be taken as supplements after meals or with meals. People who are suffering from intense vitamin A deficiency can be given vitamin A solution I.M. or aqueous I.V. supplement. A good physician will recommend what treatment is best at different stages of vitamin A deficiency and for different age groups. This article will help you identify if you or someone in your family is suffering from vitamin A deficiency. If it is true or if it is suspected then it should be reported to the doctor immediately. My daughter has an enzyme problem which has caused her to have low vit A – just above .60. They have prescribed abidec .6mls bd. Is this sufficient? And is there a tablet form of vit A you can recommend as she finds the liquid difficult to tolerate?